February 7, 2014: JSX-2 Nearing Completion; More Purchase and Training Options for Customers! We are very proud and excited to have the SubSonex Personal Jet featured as the cover story in the January, 2014 issue of EAA Sport Aviation Magazine! The full article, written by SubSonex primary test pilot Bob Carlton, can be found on EAA’s web site. This article presents the perfect opportunity to post our first major project update since AirVenture, 2013. During AirVenture, we announced the availability of refundable $10,000 Kit Reservation Deposits to begin getting customers in line to order and take delivery of the second-generation JSX-2 variant of the SubSonex Personal Jet. We also announced a guaranteed price for the first ten deposit holders, and that the SubSonex would be offered in an Ultra-Quick Build Kit intended for Experimental Exhibition category airworthiness certification, allowing SubSonex customers to receive a premium kit with a very high degree of completion, and also giving them the freedom to contract for an unlimited amount of builder assist to finish the aircraft. The AirVenture 2013 announcement was greeted with a tremendous response, and several deposits were received during AirVenture, or shortly thereafter! SubSonex proof-of-concept prototype JSX-1 was featured in the Sonex Aircraft display booth on AirVenture grounds again in 2013, and the aircraft was featured in flight demonstrations for the entire AirVenture crowd between airshow acts during two days of AirVenture. A cockpit mock-up of SubSonex JSX-2 was available in the AirVenture booth for people to try the new aircraft’s larger cockpit on for size, and customers touring our factory during AirVenture received an early glimpse of the SubSonex JSX-2 prototypes under construction. The entire report from AirVenture 2013 can be found in our News Archive. The SubSonex JSX-1 prototype was also recently exhibited at the ICAS (International Council of Air Shows) convention in Las Vegas as part of Bob Carlton’s booth, Vertigo Airshows. In addition to promoting Bob’s Super Salto jet powered sailplane airshow performances, Bob began to lay the groundwork to book performances in SubSonex JSX-2 during the 2015 airshow season. 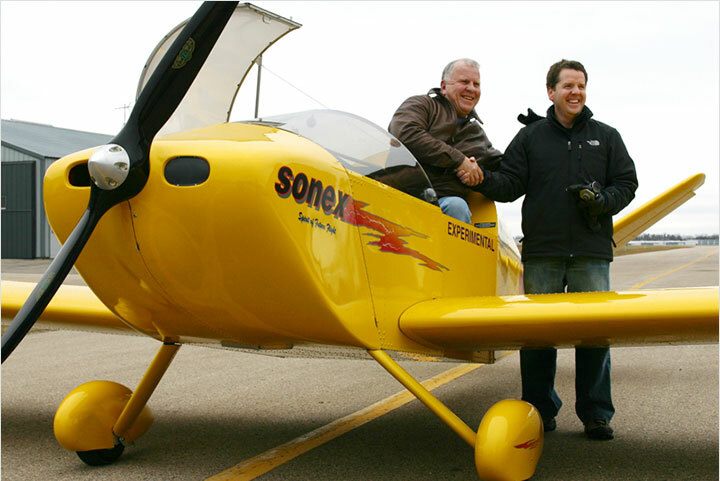 Sonex founder and president John Monnett was also on-hand at the ICAS convention to talk to other airshow performers who may be interested in purchasing a SubSonex for use on the airshow circuit. With JSX-2’s removable outboard wings, the aircraft combines the irresistible attraction of a jet act with over-the-road economy and convenience. New: SubSonex EAB Kit Option! We are pleased to announce a new Experimental/Amateur-Built kit option for the SubSonex Personal Jet. While still only offered as a Quick Build Kit, the EAB version of the SubSonex will qualify under FAA “major portion” rules for homebuilt aircraft. This new kit option is primarily being offered to help those outside of the United States import and gain approval for the SubSonex in their home countries, with most countries offering a clear path for certification of homebuilt aircraft. SubSonex JSX-1 graces the cover of EAA Sport Aviation magazine’s January issue. Read the feature story “Out of the Box” now! 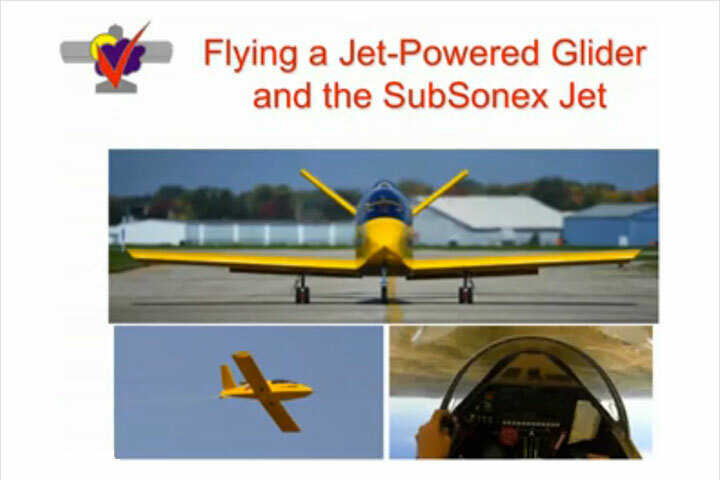 SubSonex JSX-1 captured the attention of AirVenture crowds once again in 2013! A large crowd filled the Sonex Flight Center for the announcement of SubSonex Kit Reservation Deposit details in a press conference during AirVenture. 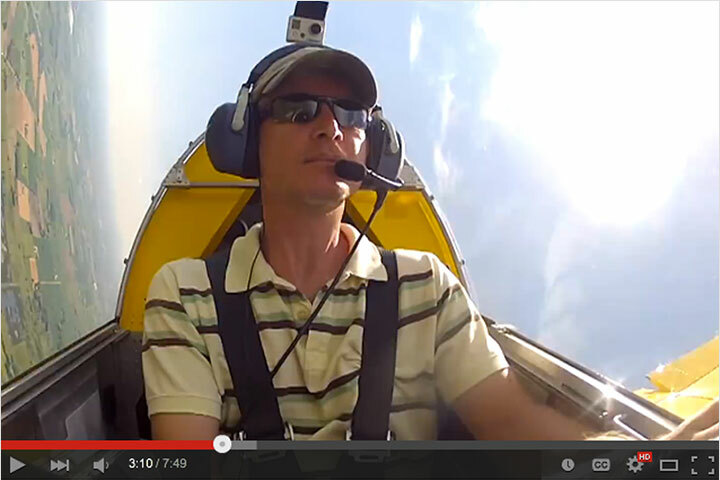 Customers had an opportunity to try-on the new JSX-2 cockpit, and several deposits were taken during AirVenture 2013! SubSonex JSX-2 Quick Build Kits for EAB construction will be offered at a $5,000 lower price, and will be an available option for all current and future deposit holders. Deposit holders will verify their choice between Experimental Exhibition vs. EAB versions of the SubSonex kit when responding to SubSonex Offer To Purchase Letters, to be distributed this spring. The EAB version of the SubSonex Quick Build Kit will still ship very complete, with all the same supplied equipment as the Experimental Exhibition kit, however, EAB customers will have to build a few more parts of the aircraft themselves. This will include construction and installation of items such as the tail surfaces, control surfaces (ruddervators, ailerons, flaps) and windshield, much like the current Sonex, Waiex and Onex Quick Build Kits. A pending FAA National Kit Evaluation Team (NKET) audit will confirm the final list of tasks required for completion by the builder. Note that EAB builders will be restricted from contracting professional builder assistance to help complete their aircraft, as the EAB kit will ship very close to 49% complete. NKET audits from our current line of Sonex, Waiex and Onex Quick Build Kits can be found on our Aircraft Certification page. Which version of the kit should you choose? The major difference between amateur-built and exhibition certification lies in who must construct the major portion of the aircraft. The choice of whether or not the customer wishes to hire a professional builder or shop to complete the aircraft will typically be the deciding factor. For customers outside the US, the certification requirements of amateur-built aircraft as opposed to experimental exhibition aircraft may be a deciding factor. All other differences are relatively minor. A downloadable Experimental Exhibition vs. EAB Summary has been prepared to help SubSonex customers make their decision. Buy a Jet, Get a Trailer! 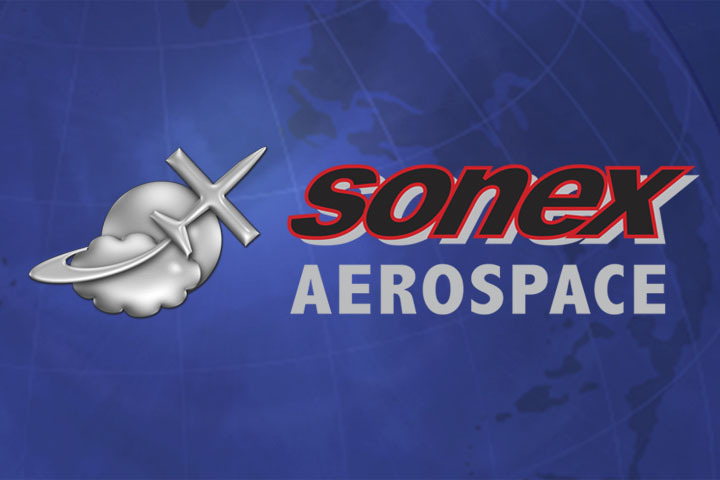 Sonex Aircraft, LLC has teamed-up with Triton Trailers to become an official dealer! Triton’s high quality trailers are the perfect fit for transporting a SubSonex. We tested our first trailer from Triton with SubSonex JSX-1 to transport it to the ICAS show. With the JSX-2 design’s wing center section main gear position, loading the new jet into the trailer will be incredibly simple, and will offer plenty of extra space inside the trailer for tools, luggage, etc. A Triton trailer will be offered as an available option for SubSonex kit orders with all necessary modifications to the trailer completed for easy loading and secure transport the SubSonex. Customers can even pick-up the SubSonex kit pre-packed in a Triton trailer from the Sonex factory as a tow-away package! Pricing details will be included in deposit holders’ Offer to Purchase Letters. Landing Gear System: Although the retractable mains were running via auxiliary power for demonstration during the show, more work has been done to refine the system, including geometry of the mechanism and down-lock system, installation of actuator limit switches, and design of a cable-actuated emergency gear release system. The SubSonex design team also took a clean-sheet approach to the nose gear system since AirVenture, redesigning the nose gear to be simpler and lighter, with a more-capable steering and gear retraction centering system. Design and installation of the main and nose landing gear doors have also been completed. We’re excited to report that the aircraft is now sitting on the finished gear instead of on saw horses! Fuel Cell: The first order of business after AirVenture was to finalize the fuel cell design so that the hard tooling could be made and the first batch of cross-linked polyethylene tanks could be molded. The SubSonex fuel cell is carefully designed to accommodate all systems passing through the aircraft from nose to tail, while offering a full 44-gallon capacity. The tank’s tooling was then produced as a metal casting, and fuel tanks for the first 10 jets have been produced! The SubSonex fuel cell, like all other Sonex Aircraft tanks, have no seams due to the rotational molding process, and are therefore extremely robust. The large SubSonex fuel tank is also designed to be removable should tank replacement ever become necessary. BRS Installation Design: BRS engineers visited the Sonex Aircraft, LLC facility last fall, and final design considerations for the BRS full-aircraft parachute system’s installation were made, including mounting location, deployment angle, harness attach points and harness geometry. The first BRS units have been delivered, and installation is in-progress. Controls: Much effort has been put into thorough design of a smooth, effective and robust control system for the SubSonex. The design team has been working on the side stick control and its linkage through the cockpit to the ailerons, mixer and tail. Rudder pedal controls have also received much attention to determine design and mounting of the pedals themselves, cable routing to the mixer assembly in the tail, and steering control for the retractable nose gear, including automatic centering of the gear during retraction regardless of rudder pedal inputs and rudder control outputs required during climbout. The flap/brake handle control has also seen a complete redesign resulting in a simple and elegant control mechanism with a smooth and very positive control feel for flap setting control, brake application, and modulation of additional flap extension for speed control during final approach. Preliminary Weight & Balance Data: Shortly after the aircraft was put on its finished landing gear, a preliminary weight and balance study was conducted. All available equipment was installed on the aircraft, and equipment not yet installed was calculated at their known weights and arm locations on the aircraft. The SubSonex design team is extremely happy with the results of this preliminary study, as the aircraft is within weight targets and promises to have good useful load with all fuel and pilot loading scenarios within the target CG range. An upcoming destructive load test of a JSX-2 wing will confirm the aircraft’s design maximum takeoff weight, gross weight, useful load, maximum aerobatic gross weight, Vne, maneuvering speed, etc. It’s important to note that all of this design and prototyping work is being conducted in lock-step with engineering and CAD drafting activities. Parts and installation modifications or redesigns are immediately transferred to 2D and solid CAD rendering files as an active part of the design and prototyping process in order to ensure production part accuracy and a quick transition from the prototyping process to production of the finalized design with fewer part production errors and drawing revisions for the new aircraft. With the addition of engineering and drafting offices to the Sonex Aircraft Hornets’ Nest R&D Center and the hiring of an additional full-time mechanical engineer/CAD draftsman to the Sonex Aircraft staff, the prototyping/engineering/drafting and documentation process has taken on a truly collaborative team approach that has become the standard for all future Sonex Aircraft design and engineering projects. With design and prototyping activities closing-in on the final detail phases of systems installations, we anticipate coming very close to original targets for first flight of JSX-2, anticipated for the March/April, 2014 time frame (weather permitting). The SubSonex design team is working very hard to achieve this goal, with tasks such as avionics installation, fuel system plumbing and canopy installation remaining. Significant work has been completed in recent months to establish a clear path to LOA (Letter of Authorization) qualification for prospective SubSonex pilots. SubSonex JSX-1 has been stationed at the home base of program test pilot Bob Carlton in Albuquerque, NM as Bob has been utilizing the aircraft in what will likely be the final round of flights for the proof-of-concept airframe. Via a simple solo check flight, Bob has obtained a permanent LOA for the SubSonex line of aircraft (applicable to both JSX-1 and JSX-2 variants of the design) based upon his cumulative hours of experience in the aircraft. More significantly, Bob has obtained approval for a PBS TJ-100 turbojet engine systems training program using his two-place TJ-100 powered BonusJet sailplane. Now any prospective pilot looking to learn the flight operations of the TJ-100 engine may train with Bob in the BonusJet with no requirement to hold a Glider pilot certificate. This development is important, as it will serve to greatly simplify the requirements for pilots to obtain a SubSonex LOA. What Will You Need to Obtain a SubSonex LOA? 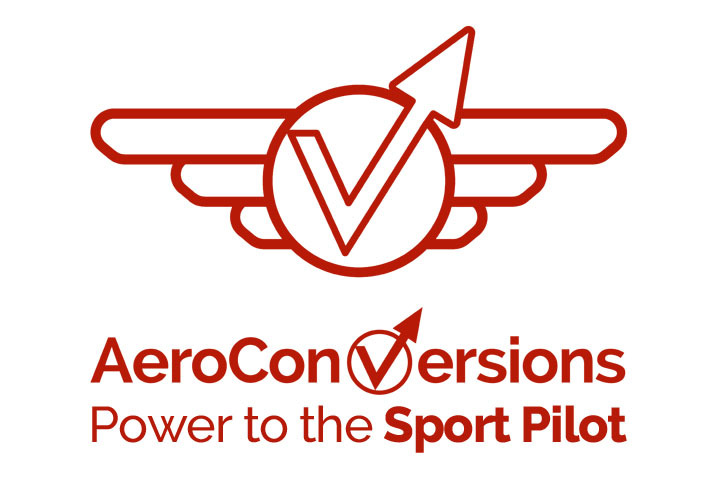 In order to reduce the amount of potential subjectivity between FSDO offices in the LOA process for SubSonex pilots, Sonex Aircraft LLC will be petitioning the Flight Standards Service office of the FAA, General and Commercial Division (AFS-800), Airmen Certification and Training Branch to define a standardized set of requirements to obtain LOA’s for the SubSonex line of aircraft. Important contacts were made at AFS-800 during AirVenture 2013, and we are hopeful based-upon those conversations that a standardized requirement can be issued. SubSonex Kit Reservation Deposit Pricing Extended! At this time, we have nearly sold all ten SubSonex Kit Reservation Deposits at the guaranteed price of USD $125,000 ($120,000 for EAB kit offering) offered during AirVenture 2013. In light of the new EAB kit option, we will be extending this price for all new $10,000 Kit Reservation Deposits placed by March 31, 2014! Orders placed after March 31st will receive the full-retail kit price: USD $135,000 ($130,000 for EAB kit offering). This new pricing structure is our current estimate of retail price based upon the aircraft’s estimated final bill of materials. Get your SubSonex Merchandise Today! SubSonex T-Shirts are available in various sizes from the Sonex Web Store for $12. Build a model or plan your paint scheme using our SubSonex JSX-2 3-View Print, available as a full-size 24”x36” plan sheet for $10. If you are seriously interested in placing a SubSonex Kit Reservation Deposit, please feel free to contact us with your questions! Bob Carlton has been flying JSX-1 at his home base in New Mexico, as part of the process to earn a permanent SubSonex LOA, and to gain FAA approval of a PBS TJ-100 systems training program. SubSonex JSX-1 shares the ramp with three of its TJ-100 powered cousins, the Super Salto jet powered airshow seaplane, and the BonusJet 2-place sailplane with retractable engine pod. R&D Engineer Brian Rupnow (right) and R&D Assistant Jake Drummond (left) take weight & balance measurements of JSX-2. A proud moment in the Hornets’ Nest R&D Center, as SubSonex JSX-2 sits on its fully-retractable gear for the first time! JSX-2’s nose gear underwent an extensive redesign for a simpler, lighter, more robust gear that we expect to work extremely well. Dreams and CAD renderings finally come to life after many months of hard work on the SubSonex electric-retract gear system! The original inspiration for the very-successful AeroConversions AeroBrake system, JSX-2’s dual truck main gear axle assembly also serves as the hydraulic brake unit, and is cushioned in a steel square tube main gear leg by a urethane rod shock absorption system. An extremely clean, simple and robust redesign of Sonex Aircraft flap control systems, the SubSonex flap lever features a smooth, positive spring-loaded detent lock and is integrated with the brake master cylinder. 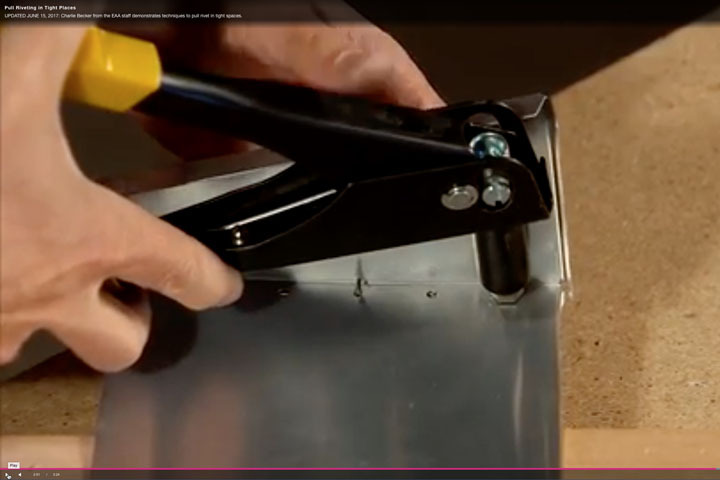 Just like a sailplane, brakes are applied after the last notch of flaps. Flaps can be modulated past the last notch for glide path control. Steering pulleys for the SubSonex nose gear. SubSonex rudder pedals will feature several adjustable positions. The SubSonex control stick has been refined to be simple and robust, with one nested tube passing through the cockpit space (will be covered by arm rests). Note the tunnel for controls in the fuel tank shape at-right. The aircraft’s Y-Tail mixer assembly is designed to be exceptionally light-weight and compact, making room for fuel system and engine installation components in the tail. Completing the design of the SubSonex cross-linked polyethylene fuel cell mold was a critical operation in the design of the aircraft. The tank is very carefully designed to fit the packaging of all vital systems of the jet. A first-article SubSonex fuel cell undergoing a fit-check after being received from molding. Note the angled contour at-right, showing the launch trajectory of the BRS system’s rocket. Once fired, the rocket will depart the aircraft instantly with no danger to the integrity of the fuel system. Another image of the first-article SubSonex fuel cell fit-check. Note the bolt-in cross-tie which helps brace the tank in-place. This cross-tie may be easily removed should removal of the fuel tank ever become necessary for maintenance purposes or replacement. It’s getting there! Sculpting of the JSX-2 nose cone nears final iterations, and the improved lines of the forward fuselage really start to show. SubSonex customers will be proud members of the pointy-nose aircraft club! SubSonex customers will now have the option to purchase a Triton Trailer with their kit. The lightweight, high-quality trailers, are equipped with a driver’s side door for easy access. Sonex will provide trailers with all modifications necessary (such as wing cradles, etc.) to transport the SubSonex easily and securely. JSX-1 fits nicely into the Triton Trailer with the help of a fuselage dolly. JSX-2 will be an easier fit, with main gear mounted in the wing center section and smaller, easier to handle removable outboard wing panels. Customers can pick-up their kit + trailer from Sonex as a tow-away package!